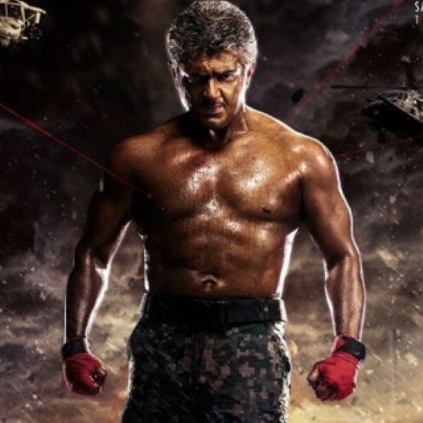 After the raging teaser of Ajith's upcoming action film with Siva, Vivegam had released, the fans were exhilarated about the dialogue in the teaser which started trending all over. Yes, we are talking about the dialogue, ''Never Ever Give Up''. This dialogue was heavily spoken about and many connected this to Ajith's real life struggles and hard-working nature. Recently, we came across some reports which suggested that there is going to be a song titled, Never Ever Give Up, which would be composed by Anirudh and written by lyricist Kabilan Vairamuthu. It also indicated that the lyrics of the song would harp on the hardships Ajith has been through in his 25-year long film career. However, sources close to the team were rather surprised about this speculation. We are informed that as of now, there has been no such idea and it is just a dialogue in the film. It will most definitely be an exciting and powerful track if it is actually made. Interesting details about this combo's next! People looking for online information on Ajith Kumar, Anirudh Ravichander, Kabilan Vairamuthu, Siva, Vivegam will find this news story useful.